Fast-paced and exciting, blackjack is one of the most well-known and popular casino table games on the planet – even most non-gamblers have at least a rudimentary idea of how the game is played. 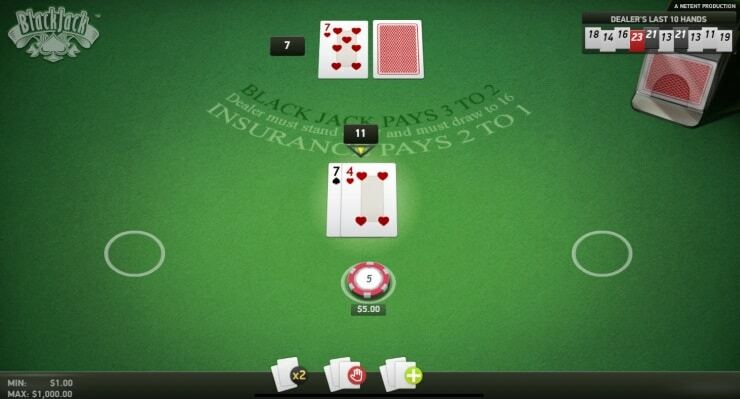 When Pennsylvania online casinos go live, blackjack lovers will not be disappointed. We can say with near certainty that not just one, but several variations of the game will be offered in virtual form at most PA gambling sites. Blackjack has earned its place as a casino staple due to its simplicity, and player-friendly, low house edge. Play your cards right and follow Basic Strategy, and a big payday may just be in your future. Read on to learn everything you need to know about online blackjack games in the Keystone State. Even though blackjack tables have spots available for several gamblers, the game is always played against a house dealer, not against other casino patrons. 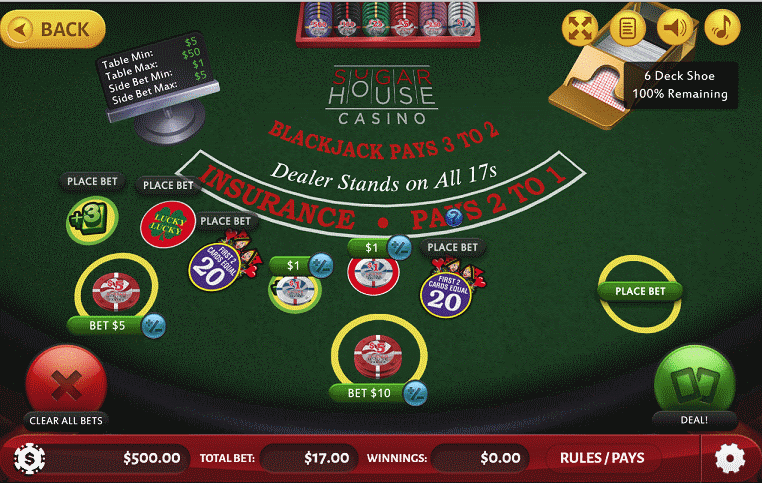 The game begins with the player selecting a chip denomination via the user interface, then clicking on one of the table’s betting circles to place the bet. To start the game, players then click the “Deal” button, which initiates the action. Bettors receive one card face up, while another is dealt face up to the dealer. A second card is then dealt face up to the player, while an additional card is dealt to the dealer face down. It’s this unknown card that gives the house their edge. From there, players must use the information they can glean from the dealer’s up card compared with their own two cards, then assess the situation and take action. Hit or stand: If a player’s first two cards constitute a strong hand, they can choose to simply stand pat, taking no more cards. If dealt a weak hand, especially one which has no chance of busting, they may choose to hit and receive another card. Double down: When doubling down, players double their original bet and receive one additional card. This move is advantageous, for example, when the dealer shows a potential bust card (4, 5 or 6), while the player holds an 9, 10 or 11, and sometimes an ace. This puts more money into play while the player has the advantage. Split: Splitting is only allowed when a player receives two cards of the exact same rank. To split, an additional bet equal to the size of the initial bet is set to the right of the betting circle. The two cards are then split up, effectively creating two independent hands. Splitting at the right time is another way for players to put more skin in the game during a favorable situation. Surrender: When a player believes that a hand has little chance of winning against the dealer’s holding, surrendering the hand is an option. By surrendering, the player forfeits their hand and half their bet is returned. Take Insurance: If the dealer is dealt an ace, a player may protect their hand by buying insurance, which is effectively a side bet that the dealer will have a natural blackjack. The bet can mitigate against losing the full amount of your original wager by essentially hedging that the dealer will win. Push: When both the player and the dealer end the game with the same hand value, the hand is deemed a push (i.e. a tie). When this happens, players receive their entire original bet back. Naturals: When the first two cards dealt are any ace and 10-value card, it is referred to as a natural blackjack. A player cannot lose with a natural, but they will normally push if the dealer has a natural of their own. Players are normally paid an extra amount (3 to 2) if they receive a natural blackjack and the dealer does not. Is there an optimal mathematical play for every situation? While some situations in blackjack may cause frustration and doubt, in reality, there is no need for guesswork at all. Statistics whizzes have long broken the game down mathematically and determined the optimal play for every single situation. This is called Basic Strategy and can be learned freely on the web. Blackjack basic strategy card for multi-deck games with S17. *Note: Basic Strategy varies slightly depending on the number of decks used, whether the dealer stands or hits on soft 17, and if the dealer takes a second card before or after (no hold card rule) the player completes his action. 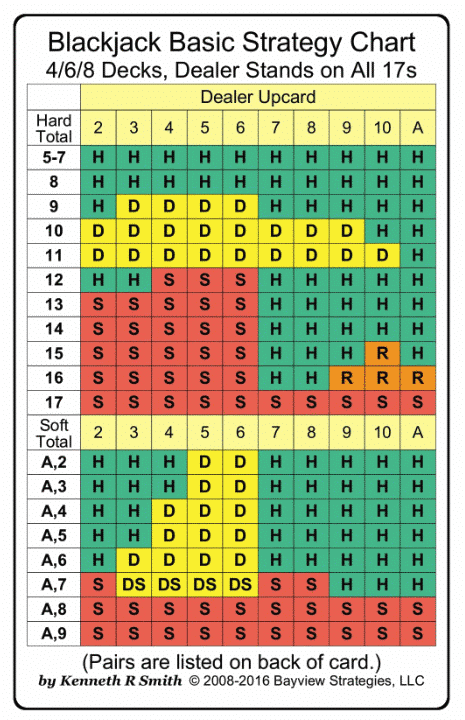 Are dealers forced to stay on soft 17? Do blackjacks pay 3-to-2 or 6-to-5? Is doubling after splitting allowed? Can players draw more cards after splitting aces? Picking the blackjack game with the best rule set is crucial for maximizing your win. However, be aware that even games with the most favorable rules are still weighted toward the house. That said, players can shave the casino edge down to a razor-thin margin by using Basic Strategy, increasing returns to up to 99.75% of each bet. The best part about playing blackjack from home is that strategy charts are readily available across the Internet and can be referenced during your gameplay to avoid any mistakes. And what are some of these common mistakes? If there’s one rule players should avoid at all costs, it’s 6-to-5 payouts on Blackjack. While other unfavorable rules increase the house edge by a tenth-or-two of a percent, if for instance, a natural pays $12 as opposed to $15, it’s a massive tax, equal to over 1% in house advantage. Lucky Lucky: Based on the player’s first two cards and the dealer’s up card, Lucky Lucky pays out upwards of 200 to 1 when three suited 7s appear. Lucky Ladies: One of the most popular sidebets around. Pays when a player’s first two cards equal 20 points. Certain combinations can yield prizes up to 1000 to 1. 21+3: Also based on a player’s first two cards and the dealers up card, the goal is to hit a pair, flush, straight, three of a kind or straight flush. Perfect Pair: Found mostly in Live Dealer games using Evolution Gaming software, Perfect Pair wins pay out up to 200 to 1 if the player or dealer’s initial two cards match in both rank and suit. Brisk gameplay: No more waiting for decks to be shuffled or mentally counting up hand values. Online, the process is automated, making an already fast-paced game even more efficient. Always room at the table: Unlike at a brick-and-mortar casino, gambling sites spread an unlimited number of virtual tables to accommodate customers. That means no more waiting around for other patrons to leave before taking your seat. Solo play: While it can be fun to share a table with fellow gamblers, sometimes it’s nice to play alone. At online casinos, you won’t be bothered by other patrons slowing down the action. Micro-stakes option: Playing blackjack at PA land-based casinos may be out of reach for some due to high minimums. Online, players of any bankroll can sit down and wager in extremely small increments. More simultaneous hands: Live casinos normally limit the number of hands a player can play at a blackjack table. Online, it’s usually possible to place a wager in every single betting circle on the table. Live Dealer: Blackjack is a commonly featured Live Dealer game at online casinos. Players can enjoy all the social interactions of playing blackjack live, while also enjoying lower minimums, automated payouts, and online exclusive wagers like Bet Behind, where players waiting for a seat can wager on other players’ hands. Low bonus contribution: When clearing a deposit or welcome bonus, blackjack play usually counts less towards unlocking these awards. Often it only contributes between 10-20% as much as a slot or progressive slot. Low loyalty contribution: Blackjack play may also count less toward loyalty programs, which can reward points that can be redeemed for cash, or other prizes. No card counting: If you’re hoping to get a leg up by counting cards, you’ll be disappointed with online blackjack. Online, decks are shuffled every hand, typically, making counting impossible. Even Live Dealer games cut the shoe at about the midway point, making any advantage gained from card counting trivial. Fast play; bigger losses: The quick pace of online play could also be detrimental if during a losing session players don’t cut their losses and practice responsible bankroll management. Don’t forget that online casino games will be available not just on gambling websites, but on iOS and Android mobile devices as well. 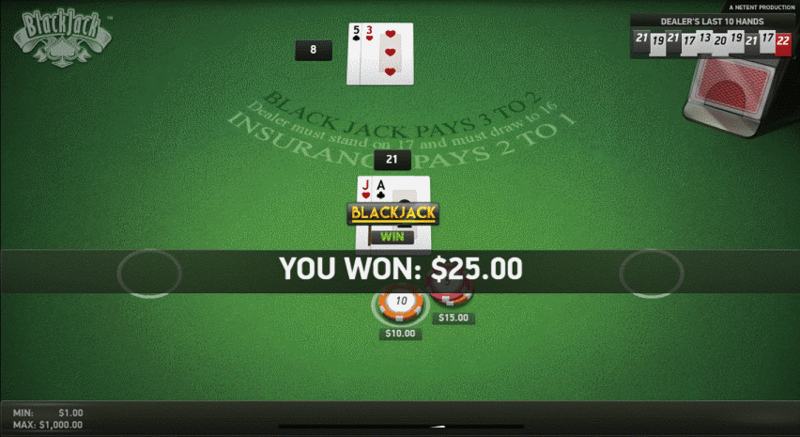 Blackjack, unlike other table games, translates to small screens quite well. All one needs to do is check out any of NetEnt’s mobile blackjack games for an illustration, which have fully redesigned interfaces meant to display cleanly on smartphones or tablets. PA mobile casinos will likely feature a number of blackjack variants, something which might not be the case for games like roulette and craps that don’t. That said, there will likely still be more blackjack options available on desktop, due to the fact that all games have not yet been converted by designers to display properly on multiple screen resolutions.